I am a professional drummer with over 15 years experience performing live and in studios all over the world. I have performed on tours, festivals, in theatre pits and cruise ships gaining a vast amount of experience in a lot of different genres. I have been teaching drums for 10 years both privately and in various different schools throughout the UK. I teach both the Rock School and the Trinity Guildhall syllabuses, grades 1-8. I have my own teaching studio with full professional equipment and can also travel to students homes or rehearsal studios. DW Drum Kit, Alesis DM5 Pro Electric Kit. Music A Level and BTEC National Diploma in Popular Music. Further pricing details: Hourly rate of £25.00 with block bookings of 4 or 8. "Jon really helped Matthew get through his grade 1 exam with distinction, a great teacher with lots of energy!" Janet Stevens. * PAY NOTHING NOW * Payments for drum lessons are made directly to Jon Bradford-Jones. TRAVEL EXPENSES: If you choose for the Tutor to travel to the Student's location, the Student agrees to pay the Tutor's travel expenses. Estimated £5.00 for every 10 miles traveled. 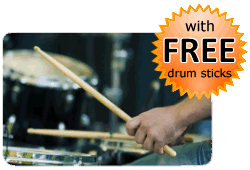 You do not pay in advance to book a drum lesson with Jon Bradford-Jones via this website. The Booking Request Form on this page enables Jon Bradford-Jones to get in contact with you to confirm a day and time for the drum lesson.